Interior Drainage Study for Consolidated Diking Improvement District No. 1 (WA) | WEST Consultants, Inc. The Consolidated Diking Improvement District No. 1 (CDID1) oversees the operations and maintenance of numerous ditches, drains, and pump stations, all located within a series of exterior levees. WEST Consultants was contracted to provide the necessary interior drainage information required for certification of the levee system. Hydrologic and hydraulic analyses were conducted to identify the sources of flooding, the extents of the flooded area, and the water surface elevations of the base flood. Due to the complexity of the flooding conditions within the CDID1 area of operations, the two-dimensional combined hydraulic and hydrologic model FLO-2D was used to calculate runoff volumes and rates, flow depths, and flooding extents. 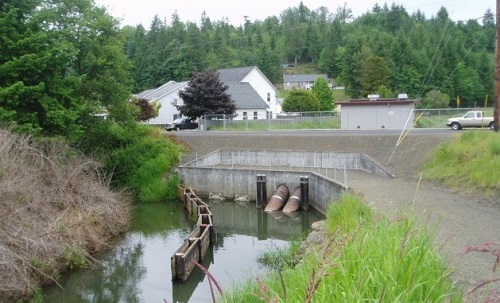 Some of the many unique features that were incorporated into the comprehensive FLO-2D model included hydrographic survey data, culverts, pump stations, interior levees, spatially variable hydraulic roughness, buildings, and spatially variable infiltration rates. The model was calibrated and verified against previously recorded events. The 1% annual chance event was then simulated to determine locations of flooding within the CDID1 area of operations during this event. At the end of the project, WEST trained CDID1 personnel on the use of the FLO-2D model. This training provided a broad overview of the model, followed by an in-depth teaching of techniques for use in simulating future storm events and identifying impacts to flooding characteristics due to changes in flood-fighting operations.